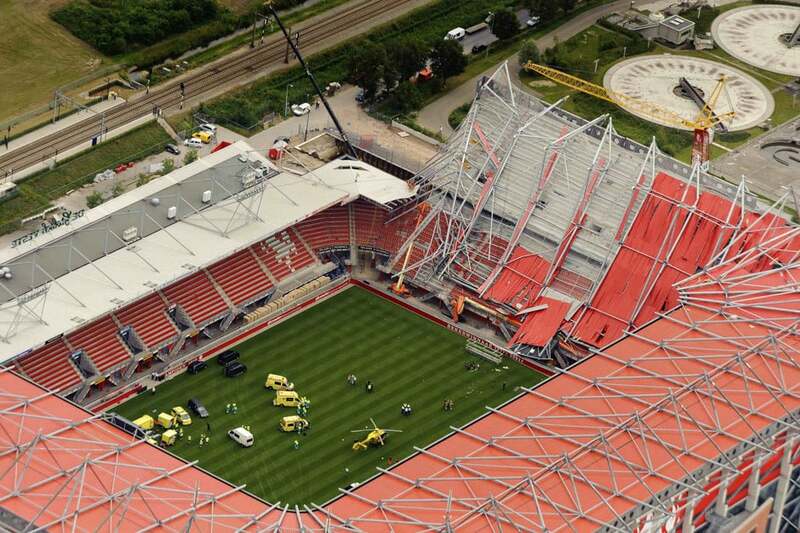 FC Twente wanted to increase stadium capacity by further extending the L-shaped extension completed in 2008 into a U-shaped one. 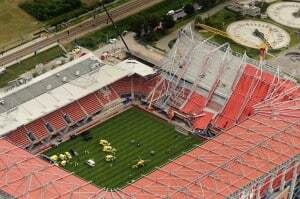 On July 7, 2011, during work to extend De Grolsch Veste stadium, the roof of extension collapsed. 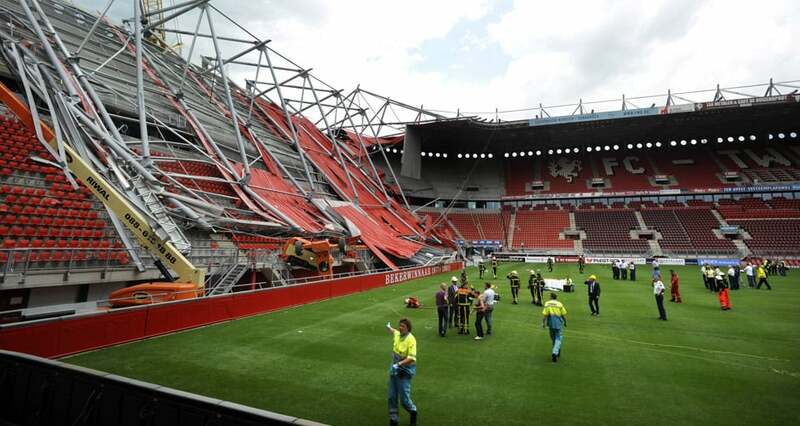 The investigation conducted by the Dutch Safety Board revealed that the roof structure’s insufficient stability, and therefore the risk of collapse, was caused by several factors. The main factor was the absence of essential coupling pipes at the back ends of the roof beams and stabilizing connections in the roof structure. During assembly of the roof beams, steel cables were used as a temporary stabilizing measure. The last stabilizing cable was removed on the day of the incident. In addition, the roof structure was already being subjected to additional loading by a video wall, suspension bridges, piles of roofing sheets and the workers present. The investigation also revealed that the roof structure was being subjected to additional loading as a result of dimensional differences between the concrete beams of the stand, the foundation of the steel structure and the steel structure itself. These dimensional deviations in combination with insufficient adjustment options mean that parts of the roof structure could only be inserted by exerting deforming forces. The deformation caused additional tension that reduced the load-bearing capacity. The combination of tensions in the structure as a result of its own weight, dimensional deviations, the load already present and the absence of stabilizing measures caused one of the roof beams to fail as a result of the forces to which it was subjected, which initiated a total collapse . As a result of this accident, twelve workers fell from a great height. Two workers were killed and nine injured, a few of them critically. One worker escaped with bodily injury. The stability of the roof structure was insufficient for the load that is was already being subjected to. Essential coupling pipes and stability connections in the roof structure were missing and this was not compensated for by temporary stabilizing measures. The incomplete, as yet unstable rood structure was subject to the load of a video wall, suspension bridges, roof sheets and ten workers. The roofing structure was therefore subject to greater loading that it could bear at the time. Because of the dimensional deviations of the concrete stand in combination with the limited options of steel structure, the concrete and steel elements of the extension did not fit in a proper way. The steel structure therefore had to be made to fit by force, as a result of which the structure in place was deformed and had less load bearing capacity.